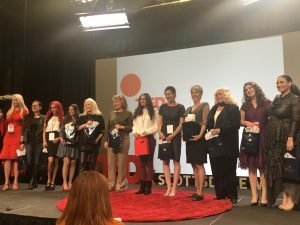 We were proud to be a sponsor at the TEDx Scottsdale Women that took place right here in Scottsdale. This was an amazing event with amazing speakers. 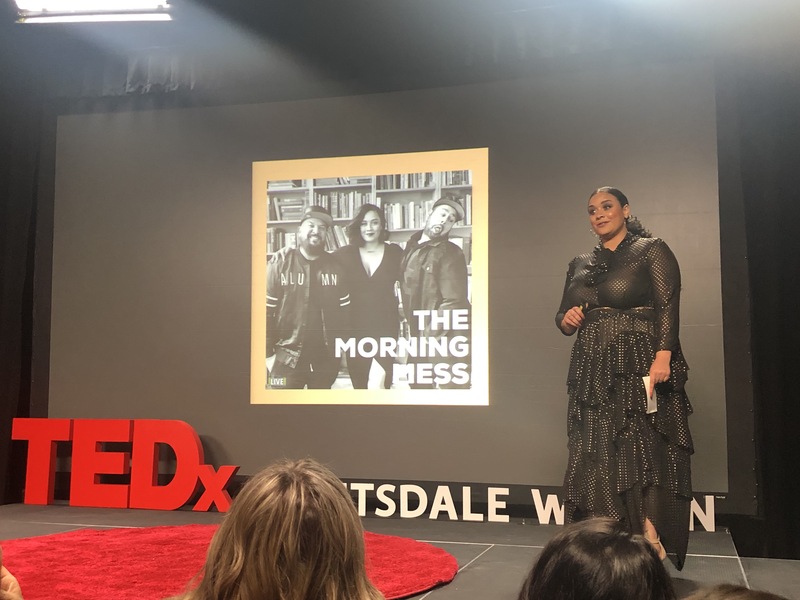 We’d like to thank all the organizers and volunteers who were instrumental in bringing TEDx to Scottsdale and making it a success. It was very inspiring to see how some of the women leaders in our community each had led such an impactful life. “It was especially a great experience to have my 13-year-old daughter attending and hearing the unique and inspiring stories of these powerful speakers”, said Sean Sarram, the CEO & Founder of Avontage. 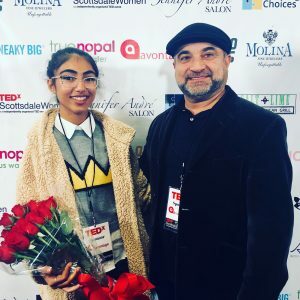 Aleena Valdez is a 14 year old entrepreneur. She is the owner of her own business called Aleena’s LemonAid Stand. She spells LemonAid with an “Aid” because she donates a portion of her money to the Phoenix Children’s Hospital to benefit kids with cancer. Aleena has donated over $2,500 to date, and continues to expand her customer base as well as her giving. Aleena lives by the phrase “You are never too young to change the world”. She is passionate about making a difference in her community and helping other girls out along the way. Because of this, she founded a girls empowerment conference she calls Girls For Progress. She wants to change perceptions of what kids and girls are capable of doing. Bogi is a master mechanic and owner of the award-winning auto repair shop, 180 Degrees Automotive in Phoenix, Arizona. A writer, a speaker, industry spokesperson and a teacher, Bogi is passionate about improving the reputation of the automotive industry, empowering women within the industry and changing the way women feel about cars and the automotive repair experience. Bogi teaches automotive basics to women around the country, consults and teaches classes to repair shop owners and other small business owners, and appears as one of three female mechanics on All Girls Garage on Velocity Channel. She is also the creator of the Chevy Montage All Female build and heads up the collaborative industrial work space where it took place. There she continues to host regular classes to introduce women to the trades in a safe and non-threatening environment. Gina works with people by exploring a deep understanding of the emotional/mental body’s impact on awareness. Together we expand your fullness, increase your awareness and explore your wisdom of your field to open and be more attuned and responsive in your communication. Over the last 15 years her learning and sharing has been about how we come together in an increasing complex awareness of structure and flow. Her cultivation of a wide full embodied self has come through deep collective work with conscious dance, network chiropractic, integral theory and STAGES, group embodied psychotherapy, and corporate business. Joni Stuker is a notable figure in the Automotive Industry, spending the last three decades consulting dealership owners and automotive manufacturers on processes and techniques to maximize their performance. As the president and founder of Owner Connect, which provides automotive dealerships training and resources to grow and improve their businesses, Joni has become a force within the industry. Along with Owner Connect, Joni Stuker is a four-time speaker at the renowned National Auto Dealer’s Association (NADA) Conference – finishing in the top 10 of 100 speakers during 2016 NADA Conference. She has consulted for NASCAR, conducted hundreds of training events, and is the author of her autobiography, Eat The Burrito. She is also a founding member of Women in Automotive: an organization that aims to empower and develop women in the Automotive Industry. As a female climbing the success ladder in a male-dominated industry, Joni has faced her share of adversity- from overcoming bias to a near-death car accident that threatened to take everything she worked for. Through it all, she has never lost her sense of humor. Joni’s mission is to be an example of resilience and determination to women and entrepreneurs everywhere. June Sharpe sat at her mother’s bedside in 2003 as her mom was dying and watched a hospice Chaplain remind them of life after death. Through stories of near-death experiences and things he witnessed as a hospice Chaplain, he gave them comfort. It was at that moment June decided to embark on the quest to become a hospice Chaplain herself. She saw how all of the “strange and para-normal” experiences she had hidden throughout her life could benefit others to prepare them emotionally & spiritually for death. It was time to come out of the “spiritual closet”. She has been working as an interfaith hospice Chaplain and Grief Recovery specialist since 2007. In this time, she has walked the journey of dying and death with thousands of patients and their families. Her stories have brought hope and joy to many and encouraged them to learn more about the hereafter. A few patients have even helped her to solidify her belief in the hereafter by keeping a “Pinky Promise” and finding ways to let her know they are alive on the other side. Katie has worked as an educator and administrator in Phoenix for the last six years. She earned a BA in liberal studies and cello performance from the University of Notre Dame, and an MA in education policy from Stanford University. Katie grew up in Michigan and still considers herself a Midwesterner at heart. You can hear her play with her bluegrass band, Cisco and the Racecars, at performance halls and beverage dispensaries around the valley. Miriam Schildkret is a local opera singer dedicated to bringing classical music to broad audiences. As a Teaching Artist with Arizona Opera, she has performed abridged versions of Hansel and Gretel and Rusalka for about 40,000 students across the state of Arizona. She will be joining Arizona Opera’s “OperaTunity” troupe in spring 2019 for the touring production of The Mini Magic Flute. In April Miriam will cover the role of Cherubino and will appear as a Bridesmaid in Arizona Opera’s main-stage production of Le nozze di Figaro. Other favorite roles include Dorabella in Così fan tutte, the title role in Dido and Aeneas, Prince Orlofsky in Die Fledermaus, and Third Lady in The Magic Flute. In addition to her work on the operatic stage, Miriam has also performed as the mezzo-soprano soloist in a number of major works, including Mozart’s Requiem, Handel’s Messiah, Beethoven’s Mass in C Major, and Haydn’s Lord Nelson Mass. Miriam teaches voice and beginning piano at Music Maker Workshops in Ahwatukee and Prestige Music Academy in Phoenix. She works with a wide variety of students, ranging from 4 to 60 years old, and helps her students harbor a love for music while honing their craft. 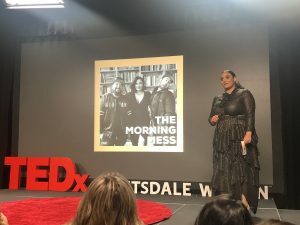 Natasha Castles is becoming a pillar in the Phoenix community as a part of The Morning Mess on Live 101.5 on air weekday mornings 5:30 to 10am & weekday afternoons 3 to 7pm. With a motto like – Create Your Own Gangster “It’s important for me to fuel others passion with an emphasis on building consciousness and purpose. People who create their own lane gives others permission to build theirs.” Natasha is also the founder & CEO of “From Castles, With Love” a foundation that produces charity events to benefit women & children who have suffered from domestic violence. Sadhna Bokhiria, Ed.D., is a professor & researcher interested in identity development, authenticity, gender relations, and social discourse. Currently investigating the correlation between stand-up comedians and higher intelligence, Dr. Bokhiria believes that it takes great courage and incredible intelligence to be authentic in today’s world and comedians exemplify this through their art. Her work has been published in collaboration with the University of Arizona’s Cancer Center, and for the past decade, she has taught and mentored in underrepresented communities in India, England, and Africa. Dr. Bokhiria takes pride in “keeping it real” and considers herself a hip-hop junkie. Miss Krystle is no newbie to the entertainment scene. As a former Miss American pageant contestant and model with almost 20 years of experience in the industry as an entertainer and musician herself, Miss Krystle dedicates every aspect of her life to her passion for music, art, and entertainment. A self-defined AggroPop (aggressive pop) singer and songwriter, Miss Krystle has expanded her passions into founding her own record label, Dukes Up Records, as well as owning and running her own entertainment law firm Delgado Entertainment Law, PLLC. In the midst of everything else, she nonetheless makes time for Arizona families and children with her charitable foundation, Young Ones United, and openly advocates for healthy living as a 6-year vegan. Miss Krystle unequivocally states today that she is forever an artist. As an independent pop artist, Miss Krystle has accomplished no small feats throughout her music career, including achieving several #1 releases on Beatport, working with Grammy award-winning producers, and topping over a million YouTube and Spotify plays with her last record. Her music has been added to 72 radio stations across the United States, and her last full-length record earned her over 500,000 plays in its first 3 months on Pandora. As an attorney she represents musicians, artists, filmmakers, writers, labels, and a diversity of other entertainers and entrepreneurs. Following her keynote speech at this year’s The New School for the Arts and Academics, Miss Krystle will be releasing her book November of 2018: Victory’s Inevitable: Keeping Your Dukes Up in the Music Industry where she shares her experiences in the music industry, standard contracts all musicians need, and stories that will likely make readers laugh, cry, and feel motivated to take their careers to the next level. Sharon Lechter is an entrepreneur, author, philanthropist, international speaker, licensed CPA, Chartered Global Management Accountant and, most importantly a mother and grandmother. A life-long education advocate, she is the founder and CEO of Pay Your Family First, a financial education organization. Regarded as a global expert on financial literacy, Sharon has served as a national spokeswoman and Presidential Adviser on the topic. In 2016 Sharon was appointed by Junior Achievement as a JA University of Success Founding Chancellor and in 2017 as Arizona Chairman for the 2020 Women on Boards initiative, which she continues to serve today. Sharon has been a pioneer in developing new technologies, programs and products to bring education into people’s lives in ways that are innovative, challenging and fun, and remains committed to education – particularly financial literacy and entrepreneurship. In 1989, she joined forces with the inventor of the first electronic ‘talking book’ and helped him expand the electronic book industry to a multi-million dollar international market. Since 1992, she has dedicated her professional life and directed her entrepreneurial efforts in the creation and distribution of financial and entrepreneurial education books, games and other experiential learning products. In 1997 Sharon co-authored the international bestseller Rich Dad Poor Dad, and has released 14 other books in the Rich Dad series. Over 10 years as co-Founder and CEO, she led the Rich Dad Company and brand into an international powerhouse. In 2008, she was asked by the Napoleon Hill Foundation to help re-energize the powerful teachings of Napoleon Hill just as the international economy was faltering. Sharon has released three bestselling books in cooperation with the Foundation, including Think and Grow Rich-Three Feet from Gold, Outwitting the Devil and her latest project, Think and Grow Rich for Women, released in June of 2014. She is also featured in the 2017 movie Think and Grow Rich: The Legacy and has released the book Save Wisely, Spend Happily in cooperation with the American Institute of CPAs. Pay Your Family First’s financial literacy board game ThriveTime for Teens, an innovative, experiential and fun life and money reality game, has received coveted awards including a Mom’s Choice GOLD Award, Creative Child Magazine’s 2010 Game of The Year, Dr. Toy’s Best Vacation Product and a five-star rating from WTS Toy Reviews. Sharon is the co-author of Your Financial Mastery, a financial education college curriculum and recipient of the 2015 Excellence in Financial Literacy Education “Book of the Year” award presented by the Financial Literacy Institute. Sharon is recognized globally as an expert on the topics of financial education and entrepreneurship. In 2008 she was appointed to the first President’s Advisory Council on Financial Literacy. The Council served both President Bush and President Obama advising them on the need for financial literacy education. In 2009 Sharon was appointed to the National CPA Financial Literacy Commission as a national spokesperson on the topic of financial literacy and was reappointed in 2014. In 2012, Sharon suffered a devastating loss when her son unexpectedly passed away. While Sharon continued to work, something changed. She put herself on autopilot and stopped working to her fullest, stopped striving to be her best, stopped pursuing the excellence she knew she was capable of. It was in this realization that led Sharon to her next project, the Play Big Movement- a call to action, online course, and forthcoming book about rising above whatever is stopping you from thinking and acting as to your greatest potential. With the Play Big Movement, Sharon is back and teaching the world how to take control of their time and money, live their legacy and create maximum impact. A committed philanthropist, Sharon also gives back to world communities as both a volunteer and benefactor. She serves on the national board of the Women Presidents’ Organization, and the national board of Childhelp, a national organization founded to prevent and treat child abuse. Sharon has served as an Instructor for Thunderbird School of Global Management for both its Artemis Program and its partnership with the U.S. Department of State and Goldman Sachs 10,000 Women program. Sharon was the driving force behind the passage of Arizona SB1449 in June of 2013, a bill that requires financial literacy concepts to permanently be incorporated into economics standards and created a separate statue for those concepts. Sharon’s contributions have been recognized globally. Childhelp has honored Sharon and her husband, Michael, as recipients of the Spirit of the Children Award. Sharon and Michael were recognized as an Arizona “Power Couple,” and Sharon was also named as a Woman of Distinction by the Crohn’s & Colitis Foundation of America. She was honored with a 2012 Positively Powerful Women award for Philanthropic Leadership, by the Phoenix Business Journal as one of 2013’s 25 Dynamic Women in Business, and by National Bank of Arizona with the 2013 Woman of the Year award and Arizona Business Magazine as one of the 50 most Influential Women in Arizona Business. In 2015 Sharon was honored by Florida State University’s Women for FSU with a Gift of Wisdom Award, Women Presidents’ Organization with the Mary Lehman MacLachlan Economic Empowerment award and by the National Financial Educators Council as the Financial Educator of the Year for 2015. Sharon was also honored with the prestigious 2015 International Profilo Donna Award by Profile Woman. In 2016, she was awarded the Lifetime Achievement award by Habitude Warrior International and in 2017 with a Lifetime Achievement Award from The Best You. In 2018, Sharon has been honored by In Business Magazine’s Women of Achievement with their Linda M. Herold Lifetime Achievement honors, with a Global Voice Award from the World Woman Foundation, and as a Trendsetter by Trends Charitable Fund. In addition, Sharon has the distinct honor to be the only woman inducted into the Personal Development Hall of Fame and one of only a few honorees to receive the Gold Medal Award in Literary Achievement from the Napoleon Hill Foundation.